1. God told you to! (this is my personal motivation). Obviously, if God tells you to do something, you need to do it. And Jesus (who is, of course, God) told us in Matthew 28:18-20, “All authority in heaven and on earth has been given to me. Therefore go and make disciples of all nations, baptizing them in the name of the Father and of the Son and of the Holy Spirit, and teaching them to obey everything I have commanded you. And surely I am with you always, to the very end of the age.” If Jesus told you to do make disciples of all nations, including the one you live in, you’d better do it. 2. People need Jesus now! 3. People need Jesus later! We all know what happens if you die without Jesus. The only way to avoid eternal death is to accept Jesus as Lord and Savior. Hell is a real place where the worst of the punishment is complete separation from God, not to mention the lake of fire that only burns and does not consume. Do you really want your friends to end up there? Of course not! I wouldn’t wish that on my worst enemy! So why don’t we warn people? So now you have three great reasons to tell people about Jesus. Now you just need to pick one and go for it! When Prasan Pinak first arrived in the big city seven years ago, he knew he’d have a lot to learn. The small tribal village he’d grown up in hundreds of miles away was a far cry from the noise, pollution, and crowds that now surrounded him. He knew the language these people were speaking, but the dialect was so different that it might as well have been a foreign tongue. But Prasan decided to get to know his new community as best he could. He walked to homes and businesses, visiting neighbors and sharing the love of Jesus. At first, all he encountered were resistance and anti-Christian sentiment. He invited people to join him on Sunday mornings for worship, but no one ever showed up. This went on for four months— silence, rudeness, nothing to show for his daily labors and outreach and no interest in the Gospel whatsoever. Then one Sunday morning, Prasan got up before the sun rose and walked through his darkened neighborhood. God reminded Prasan that day of a truth that would become the foundations of his ministry. So Prasan chose to trust, even in the face of circumstances that told him otherwise. And he continued praying for his mission field during his early morning walks. Within a very short time, 25 people chose to follow Jesus and began attending his church. As the weeks passed, his new congregation steadily grew. As I read this story about Prasan Pinak in send! the Gospel for Asia News Magazine, it really struck home. Earlier in the article it explains how Prasan gets up around 3:00 or 4:00 every morning, walks miles through the silent city streets, and prays and weeps for the need of the lost and his congregation. With his congregation reaching five hundred believers, rich and poor alike, meeting in different places at different times, he has a lot to bring to God. So, how does this relate to you and me? Three ways: Prayer, trust, and doing. God really works in prayer. I imagine it’s His favorite thing to do, answering prayer. And how often I forget it! You and I should— need to be— have to be praying more if we wish to see results. What’s an hour of lost sleep matter if it’s spent praying to the Living God, Creator of man and universe? I believe Prasan’s spiritual success was built on prayer. In God we trust. It’s written on our coins. It’s written on our bills. Is it soundly written in our hearts? We so much like to be self-sufficient. Don’t have money? Get a job. Not doing well in school? Study harder. Don’t know how to do something? Look it up on the internet and figure it out. Not having victory over sin? Try harder. Don’t see results in evangelism? Learn more and do better. It seems that in a world where “do it yourself” and self-sufficiency are glorified, we forget that God is responsible. We must learn to put our faith and trust in God. He’s the only one that can make a difference in people’s hearts, we must trust in Him to do it. Give up on trusting in ourselves for results. Doing. Notice that Prasan didn’t simply sit in his room praying and trusting for God to take action. He spent much of the day meeting people, sharing God’s love, and inviting. Don’t wait for someone else to bring the gospel into the conversation; do it yourself. Then, talk to God (this means a two-sided conversation, wait for Him to answer) and trust in Him to change people’s hearts. Today I’d like to make a confession. That’s right. I used to. I would go out and hand out tracks just about every day. This went on for some time. God blessed my spirit with joy and I was content with life and myself. For some strange reason, I stopped. Oh, it’s been a few years since that period of my life. I’ve started ad stopped again here and there: I’ve even led a few people to the Lord since then. But I’ve not been able to say, with Paul, “This one thing I do…”. I regret falling out of a good habit. But God has been merciful, even when I’ve flat out told him, “NO!”. I joined this blog hoping to be a blessing to others. And I sincerely hope that I am. But I have another agenda. Perhaps, writing here about witnessing, I’ll actually have to witness! What hypocrite would write about evangelism and then not go out and do it, right? The only problem is, I’m a wimp. I mean, who actually has the guts to go out and tell completely random strangers about Jesus? That’s got to be the most offensive name of the Age. People look down at their feet and awkwardly kick the dust when you bring up that name. People will do that little breathing-out-their-nose thing and shake their heads when you mention Him. They’ll roll their eyes and look at you like some sort of idiot when you talk about the Lord. Oh, yeah… The book of Jeremiah says we shouldn’t fear man’s face: that we shouldn’t be afraid of rejection. After all, they’re not really rejecting us, are they? They’re really rejecting Christ. That’s what He says. So, there: I said it. I need to be a witness for Christ more than I am now. I hope you’ll help me with this. Gospel tracts are terrific. I really mean that, they’re terrific. They can be used when you don’t have enough time to start a conversation. They can be used to start a conversation. I’ve heard several stories of people that read a gospel tract which prompted them to trust in Jesus. I even heard of a friend of a friend who was hitchhiking, saw a dirty tract laying beside the road, read it, and believed in the saving power of Jesus. There’s always a struggle for me to find a gospel tract that I really like. It either has good looks with a watered down gospel, or it’s got a bold gospel message with horrible looks. Some work really well, like the million dollar bill tract, but for older people, they don’t really cut it. With super tiny print and a silly design of fake moneys, they don’t work for seniors. But if you do get ones that older people would accept, you feel really funny about handing some teenager a glossy print picture of a rose with the words “You are special”. Thats when another idea came to me: make my own personalized tract! People had talked about it and we had made one long ago as a family. So over the past year I’ve made four or so tracts all differing in subject and introductions but all having the essential points of the gospel that I knew it needed. And here’s the cool thing, people seem to take them a lot easier. When you can smile, walk up to someone, and say, “Here, this is for you. I wrote it.” They seem to be a lot more able to accept the tract. I recently took a trip to California to see my grandpa and I took about fifty of the tracts along (the one in the picture above). I ended up only giving away about half as I walked through the airport, plane, and in town, but it was enjoyable. Pretty much the only people that didn’t accept the tract were people that didn’t even look at it; they just immediately rejected contact from a stranger. So, it’d be a good idea for you to make your own gospel tract. A really good idea. What I did was find a computer program that easily makes quarter-fold cards. 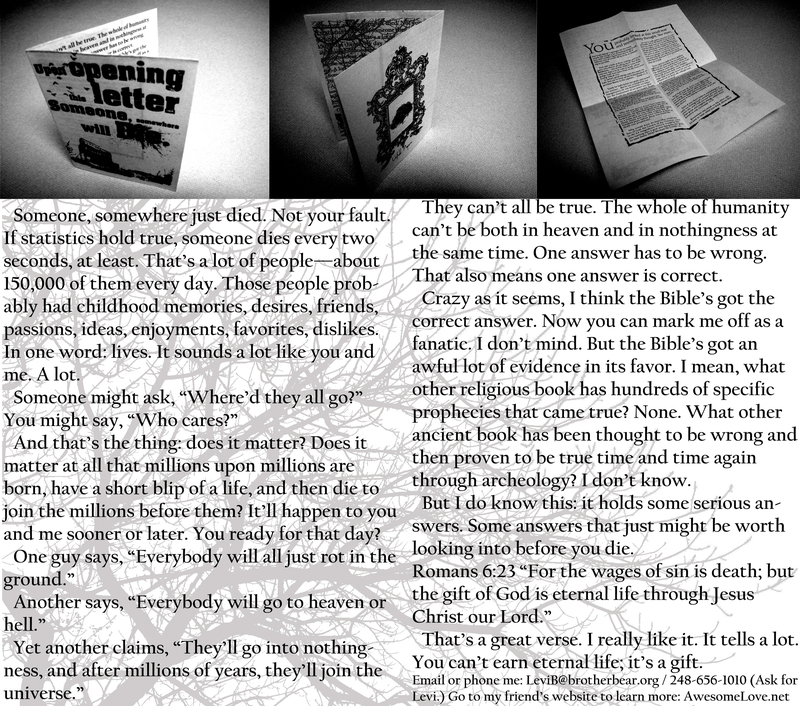 The first tracts I made had simple designs, you know, just large text on the front, and words on the inside and back. But I like graphics and pictures, so the more recent ones have more of that type stuff; the one in the picture can even be unfolded for more on the inside. After I make several revisions and had a few people read it, I printed several, folded them, and gave them away. Also, pray before writing, that’s really important. Oh, and use verses. I think you get the basic idea. Go for it! P.S. Don’t let tracts take the place of actually witnessing. That’s invaluable. (Levi) Ask if you want to know more. 1. What do you mean by _____? This is a good way to find out what people are really saying. For example, when some says, “I am a Christian,” you want to know what they mean by Christian, because there are people who call themselves Christians but don’t believe in the basic pillars of the Christian faith. Other terms can have similar differences when used by different people. Use this question to make sure you aren’t using the same word but meaning two completely different things. 2. How do you know that you are right? This is a great way to make people think about what they believe, but don’t overuse it. A good way to avoid sounding like a broken record is to vary the wording on the same question. People will think that you are obnoxious if you just keep asking this question over and over. And being obnoxious will definitely turn people off. Remember also that this is an important question for you to be able to answer as well. 1 Peter 3:15 says, “But in your hearts set apart Christ as Lord. Always be prepared to give an answer to everyone who asks you to give the reason for the hope that you have. But do this with gentleness and respect.” If someone turns this question on you, be sure you can show them why you are confident in Christianity. There is solid evidence for the validity of Scripture, the resurrection of Jesus. Find it and use it. A good thing to be sure of is that the other person will accept the evidence you present. Add this question to the list as well: “What will you accept as evidence?” That way you can give the most persuasive evidence to them because you’ll know what it takes. 3. What if you are wrong and you die? This will also be another question that people will be likely to turn on you. Do not avoid it. Obviously, if you’re talking to an atheist and you are wrong, there are no eternal consequences, and you end up feeling complete here on earth. But if you’re talking to a Muslim, you will need to accept and admit the fact that if you’re wrong you will go to hell. However, after admitting this, you can move on to explain why you are sure that you aren’t wrong and why the Bible is the most trustworthy source of information. 4. What difference does that make in your life? This one confused me for the longest time. But here’s what it really means: What are the logical actions that stem from your beliefs? For a Christian, it would be to love God, love our neighbors, and spread the truth of Jesus. For an (honest) atheist it would be to live for themselves, because nothing will matter after this life anyway. For a Jew, it would be to do everything possible to follow God’s Law as defined by the Torah and the Talmud. Every belief system has logical actions that follow it. Many people don’t see the implications their beliefs have (for example, many evolutionists will condemn euthanasia, but if we’re working towards a stronger race as evolution implies, why should we let the weak ones live? Many evolutionists will refuse to accept this notion, but it’s only logical. But don’t be surprised by the bold person who admits and accepts this, as horrible as that sounds). So now you have a toolbox that you can use to get people to see the faults in their belief system. They are not fail-proof, but they definitely help. Also, don’t just spit out these questions and make people feel stupid. As Bill Jack put it, “Use them as a crowbar, not a sledgehammer.” Pry their minds open to the possibility that Jesus is the Way, Truth, and Life. Don’t bash them over the head and watch them explode from your vast wisdom. Hope this helps as you follow the Great Commission!